1. Cross Equatorial WInds in the Southern Arabian Sea have strengthened considerably today, and at 30 knts, are favourable for advance of South West Monsoon. A major push is seen from the Somali coast . 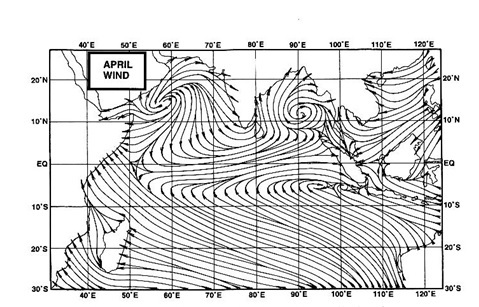 850 level winds just about tending to get favourable for Monsoon over Kerala..
2. Also , a hot day on 1st June , with Dadu & Moen Jo Daro in Pakistan recording 51c (Rounded), Nawabshah 50.5c, Jacobabad 50c , and Churu in India recording 49.7c, Ganganagar seeing 49.1c. We see the seasonal Low creating a very favourable gradient for Monsoon, with the core pressure likely to go down to 992-994 mb next 2 days. Consequently, the West Coast off shore trough is seen strengthening. LWD remains strong with the trough "head" at 998 mb. The UAC off the Kerala coast extends to 700 hp, tilting with height. 3. Monsoon likely to advance into Kerala by 3rd June. Increase in rains in Kerala on Saturday. 4. Monsoon likely to advance into NE Sates by 3rd June. Mumbai: Partly cloudy on Saturday and Sunday. Chances of development of Thunder Clouds in the Eastern skies. The thunder showers may drift over certain parts of Mumbai by Saturday and Sunday evening. Pune: Heavy Pre Monsoon Thunder showers lashed Pune and Mahableshwar on Friday 1st June.. Partly cloudy this weekend. Heavy thunder showers likely in Pune this weekend.